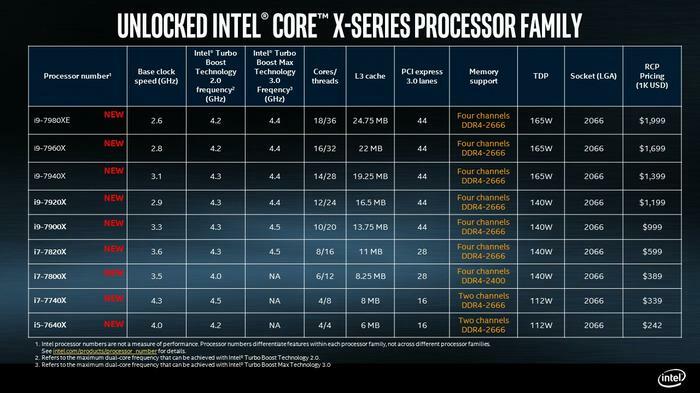 Intel has written to HEXUS to say that it has unveiled the full specifications of the Core-X Series processor family. 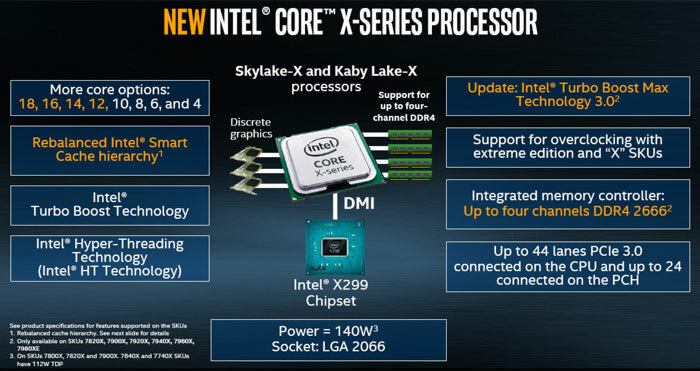 As the 4- to 10-core Intel Core X-series processors are already on shelves and available at multiple retailers, along with more than 200 Intel X299 Chipset motherboards, today's big news concerns the 12-, 14-, 16- and 18-core CPUs in the lineup. Intel reckons its new Core-X Series processors are perfect for "extreme computing demands for virtual reality (VR), content creation, gaming and overclocking". Above you will find an official table from Intel containing all the key specs of its Core i9 processors. Below I have also embedded a full slide with all the Core-X family members tabulated, for an overview, but you will likely have to click it to zoom in and read it. All the Intel Core i9 family processors provide 44 PCIe 3.0 lanes off the CPU. Lower down through the Core i7 and i5 products the number of lanes diminishes to 16, as you can see in the dark table directly above. Thus the platform offers up to 68 PCIe 3.0 lanes, which is great for I/O speed and expandability. 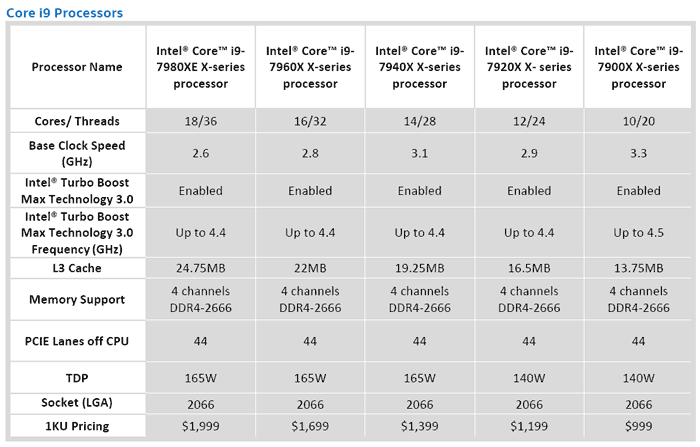 The whole of the Core i9 Series will offer high end performance but you can see that Intel doubles the price between its lowest priced Core i9, the 10C/20T i9-7900X at $999, and the top end part, the Core i9-7980XE with 18C/36T. With the increase in core count the base clock speeds are generally seen to decline, but the L3 cache climbs steadily too. On the topic of performanc, Intel says that content creators "can expect up to 20 percent better performance for VR content creation and up to 30 percent faster 4K video editing over the previous generation". Meanwhile, for gamers, Intel claims the new chips will provide "up to 30 percent faster extreme mega-tasking for gaming over the previous generation". If you are wondering what 'extreme mega-tasking' is, it is a benchmark that consists of measuring the time it takes to perform a video encode using Adobe Media Encoder, while playing Overwatch in ultra-graphics quality settings, and simulateously recording & streaming to Twitch. 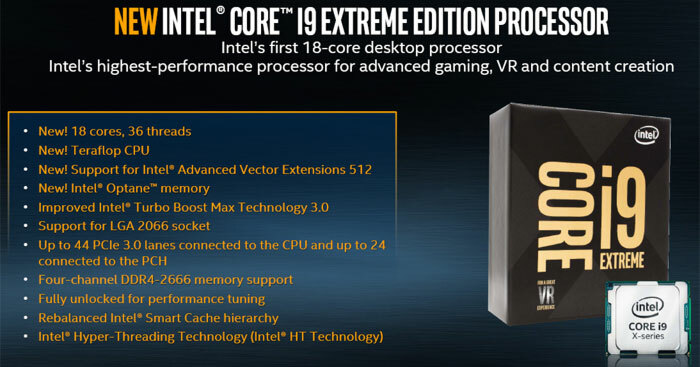 Concerning the launch dates, we already have availability of the lower core count Core-X chips, and one Core i9 - the Intel Core i9-7900X, which was reviewed by HEXUS back in mid-June. Intel says you will be able to get your mitts on the 12-core Intel Core X-series CPU from 28th Aug, and the 14-, 16 and 18-core Core-X CPUs from 25th Sept 2017. Can we have 2 huge asterisks? The first is that the turboboost 3.0 to get those numbers is a single core and that 4+ cores being boosted is within a gnats bottom of the base clock. The second is that these monolithically sized and priced CPUs cost “up to 200%” more than the previous generations with only an “up to 30%” performance increase, the colossal changes in performance metrics reflective of pricing is crazy. I don't know why but all this “up to” poodoo is really getting on my nerves, especially with the massive disparity of their lineup and all of a sudden most ate chill with Intel gouging both the Xeon market and the Enthusiast market. The motherboards for these CPUs cost a huge amount, so it makes them even worse value than they already are. There's no reason for the motherboards to cost as much as they do. With each new ‘feature’ the oems find an excuse to raise the price! Zero competition for Intel has also meant stupid prices. Come on… Stop buying intel, at least for one computer. Hurt them. Same goes for motherboards as there's hopefully someone, somewhere, selling something second hand. Until consumers stop throwing away their cash these companies will milk us until we're dead and buried.